The pairs of urns framing the front door have almost the same plant palette for the sake of consistency, but different arrangements to keep it interesting. The front of the house is shaded by gorgeous old oaks, so our plant picks take that into consideration. The front pair goes for height with grass-like juncus standing proud at the center and blue plumbago peeking out around the side. Blazin Lime iresine reminds us how exciting green can be as it steps us down from the height of the juncus to the rest of the planter. Pink and white begonias are a nice middle height. Blue lobelia is delicate in the front and creeping Jenny spills over the side. The set of planters closer to the door is a little less dramatic without the juncus and plumbago, but the white sunpatiens in the center will soon grow to give a nice, full shape. If you haven't heard of sunpatiens, you're missing out! They are a relatively new type of inpatiens that thrives anywhere from full sun to full shade. Iresine, begonias, lobelia, and creeping Jenny show up again. Lobelia offers one of the only true blues for annuals. It doesn't like extreme heat in full sun, but filtered light and plenty of water keep it happy. This variety is especially valued for its dark blue - a rare sight in the garden. 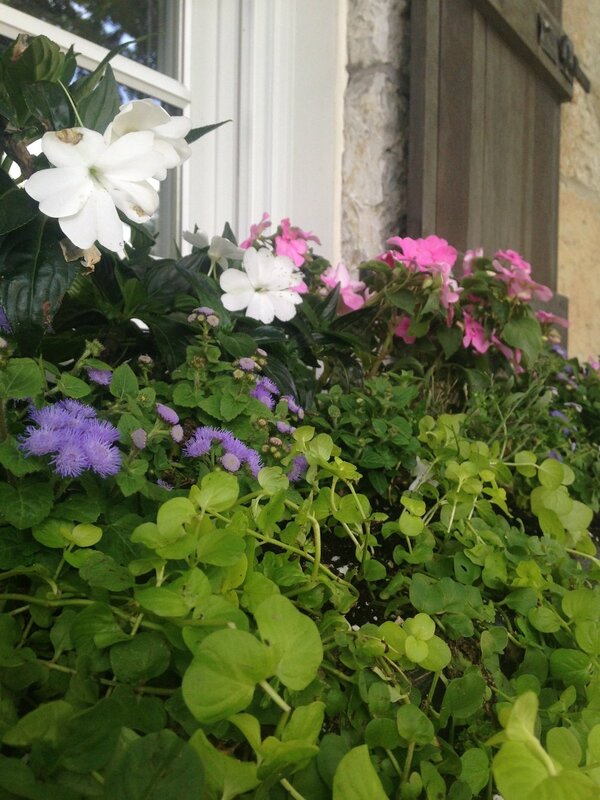 Window boxes often have simpler designs, but it's no less fun to plan the perfect plants to light up a window. For pink we went with classic impatiens. They can't be beat for the shade, although in recent years you need to keep a sharp eye out for impatiens downy mildew. We brought the sunpatiens back in for some white to anchor the center. Blue ageratum and lobelia line the front. If you're looking for the perfect plant to hang over the sides of a container, creeping Jenny is currently one of our favorites! It can take sun or shade, it grows quickly but doesn't overwhelm, and it's frost hardy so you can even leave it in the pot for your fall decorations! 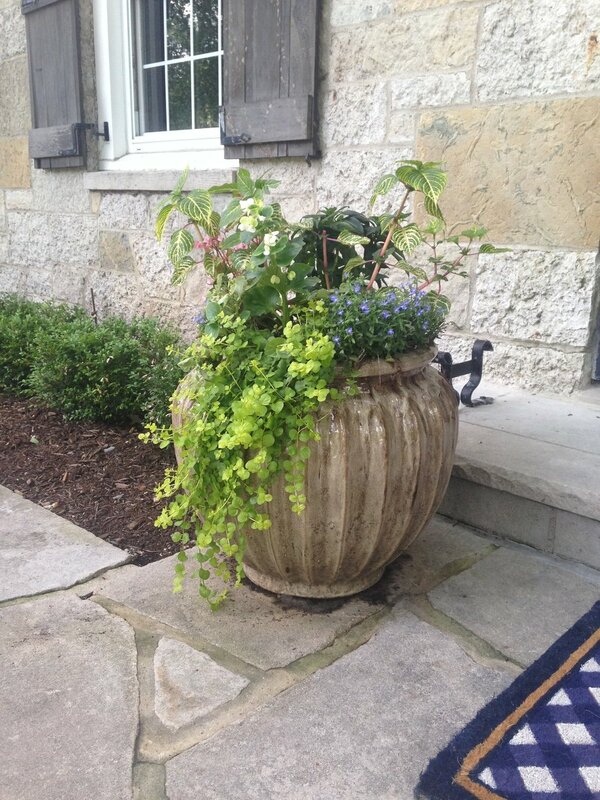 We wanted height and variety for the large round planters framing the pool. For blues we used plumbago, ageratum, verbena, and victoria blue salvia. Zinnias provide a splash of pink. 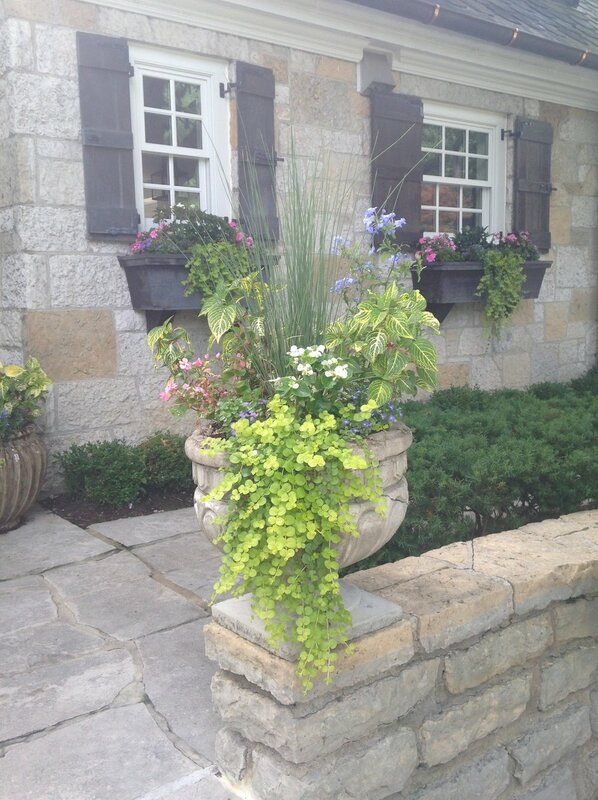 White geraniums keep the design balanced color-wise. Licorice plant spills over the sides with a lovely silver color and slightly fuzzy texture. Rather than placing the tallest plants at the center like you would typically find in a round planter, we put them in the back to the side and mirrored the design on either side of the pool. This let us play with a greater range of heights and create a design that would show off everything at once from the end of the pool since that is the perspective most people will see it from. Succulents are in right now, and we love it. In these concrete planters atop stone walls, we thought the subtle hints of color would fit the more toned-down patio area off to the side of the main activity. These ones don't have quite as much color as the other planters, but the succulents themselves are tinged in pinks and blues, and we have some blue ageratum and pink begonias with a little bit bolder color. We will have to pinch the begonias as the summer goes on to keep them from taking over, but you can't expect perfection without a little work! Do you have a special event coming up, or are you just looking to make your outdoor living space a little more exciting? 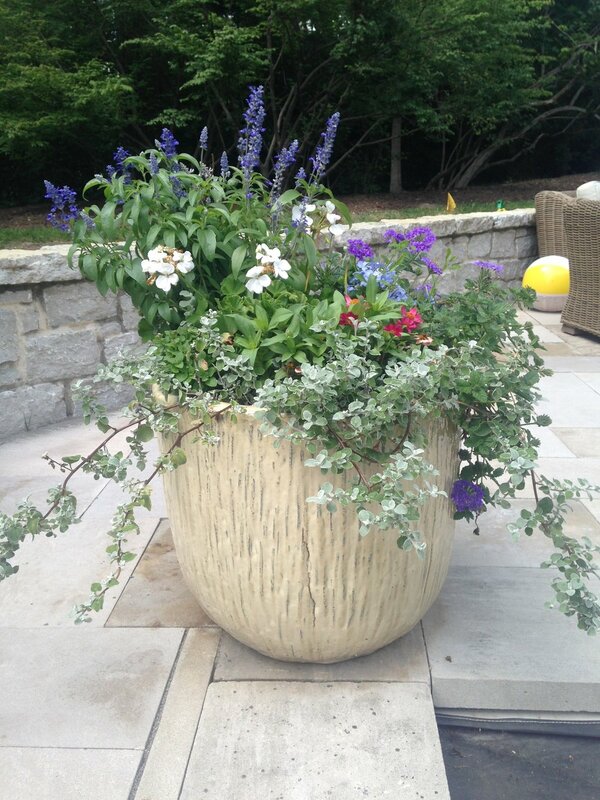 Containers are an easy way to make a big impact! 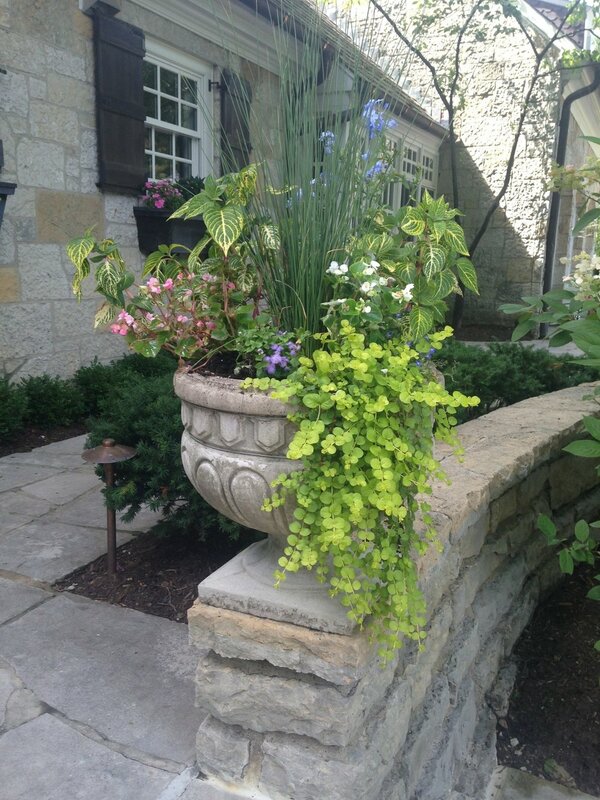 Contact us today to learn about what we can do for you, or browse our gallery to see some of the other planters we've planted. Newer PostBeyond Hostas: Shade Plants Galore!